In 1950 Mercedes-Benz team manager Alfred Neubauer had witnessed 3 Jaguar XK120 cars at Le Mans, and was impressed by the all-new design from Britain. These cars heralded a new era of aerodynamics, but the three Jaguars were plagued by mechanical failures. Were it not for these breakdowns, Jaguar would have won the 1950 Le Mans race by a significant margin. It was apparent that Mercedes needed a lightweight, aerodynamic sports car with a production based drivetrain to ensure reliability in order to compete with the Jaguars. In 1951 that new car underwent initial testing at the Nurburgring, and the rest, as they say, is history. The 300SL utilised a proper space frame chassis, meaning it was a space frame in the traditional sense and not a glorified ladder frame. It was designed with aerodynamics and weight reduction in mind from the start, the lack of doors being the result of the quest for lightweight strength. During the first testing of the car, it was merely a spaceframe, engine and drivetrain – with no bodywork and therefore no doors! The design of the structurally integral space frame tubes did not allow for a traditional hinged door. 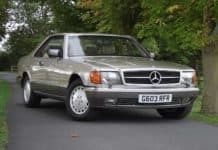 Jaguar’s solution to this problem was to use a much smaller traditional door which extended downward low into the sills, however Mercedes took a different approach. Instead of compromising strength by opening the door down into the sides of the car, they extended the opening aperture up and into the roof, with a central hinge, and at that moment, the gullwing door was born. What began as a simple necessity became an icon of automotive design. The road going version of the 300SL was unveiled at the International Motor Sports Show in New York in January 1954, known internally as W198. The automotive press were amazed by the new car, and it was instantly desirable. The intensive nature of hand built production and that spaceframe chassis made the 300SL expensive to build and buy. 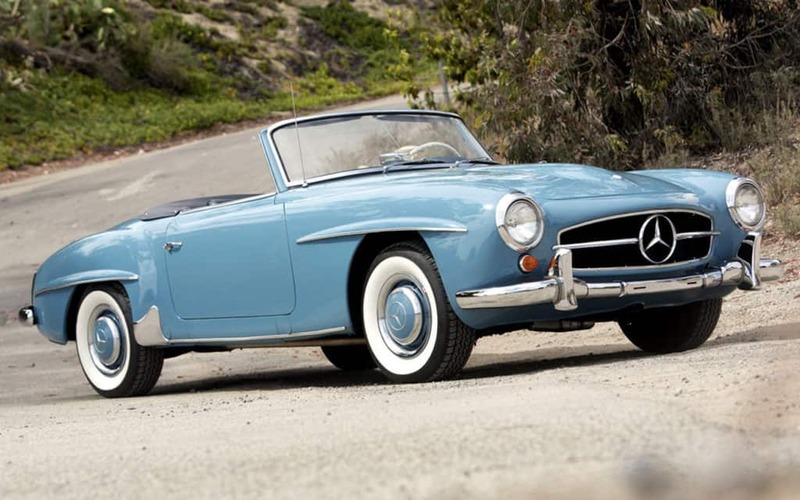 While the 300SL Gullwing was being sold in the USA for nearly $7,000, the 190SL came in at just $3,998. At this price, it was still more expensive than European rivals but had higher levels of sophistication and style. It was also more practical and reliable than any Italian offering. The 190SL could be ordered as a convertible or a coupe with removable hard top, a format the SL would adopt for further generations. The original 300SL was fast, powerful, raw and elegant, but with half the horsepower, the 190SL was more show than go. As more Ferrari road cars began to appear and Jaguar’s XK program hit full swing, Mercedes needed a car that offered style, sophistication and sporting credentials whilst remaining affordable for the target audience. 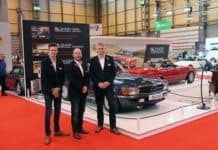 Aston Martin’s new DB4, Jaguar’s XK140, Porsche’s 356 (and soon to arrive 911) the Facel Vega and to some degree the V8 corvettes were all changing the landscape of the consumer car market of the era. 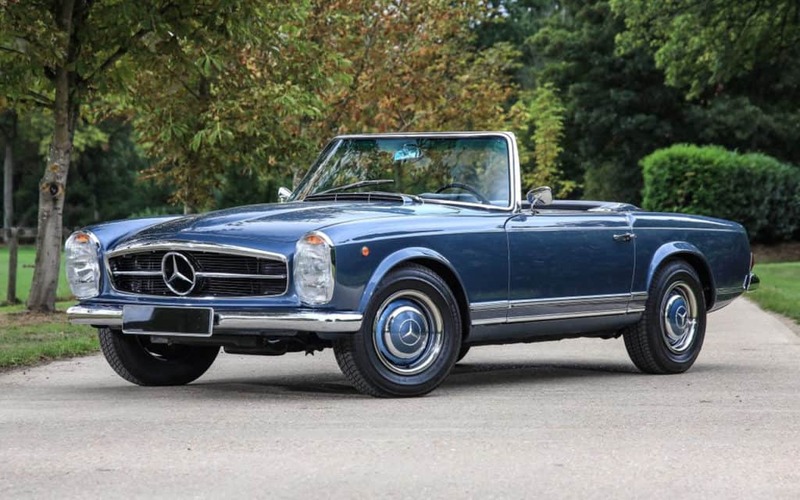 The Pagoda represented the first SL that was not entirely inspired by race track exploits of other cars. The 300SL was a racer for the road, the 190SL was styled like the racer but lacked the necessary ooomph to be a proper sports car. 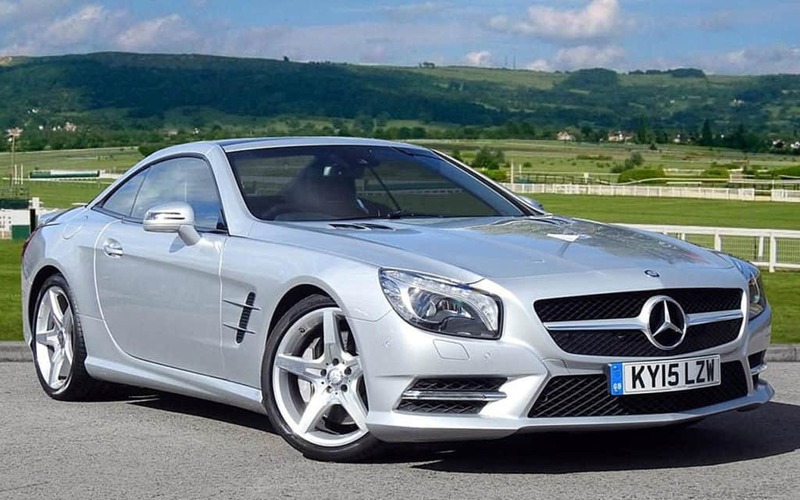 The Pagoda’s six cylinder engine and clever design realigned the SL name to luxury, convenience and ample power. Instead of being a toned town racer for the road, it was a road car and tourer in it’s own right. 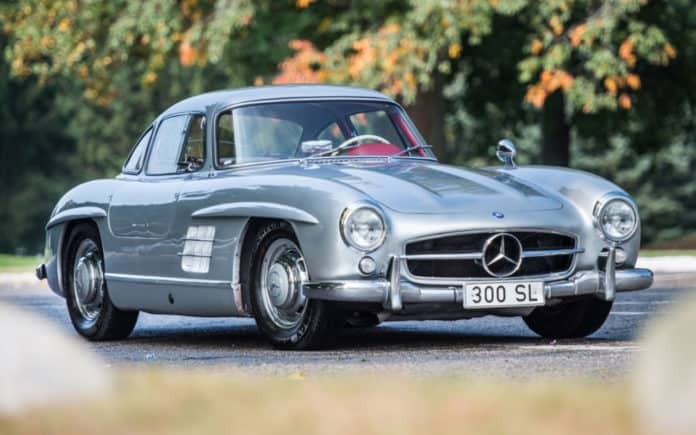 This new car was to combine some of the speed and panache of the 300SL with the best qualities of the 190SL, the handling, neat packaging and production costs. It would be easier to use and live with than both the 300SL and 190SL, setting a new standard in what a road car was capable of in terms of more than just outright performance. 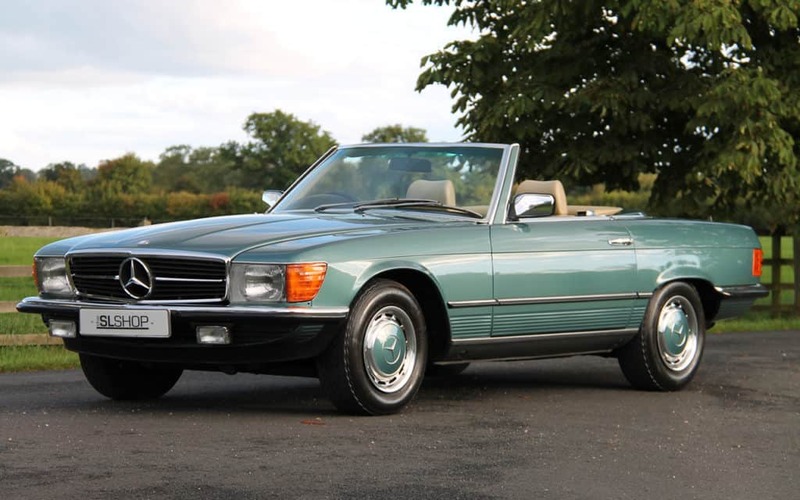 Not only was the Pagoda more luxurious than the 190SL, but it offered greater safety thanks to an early form of a crumple zone. The Pagoda was the first sports car to incorporate ‘designed in’ safety, something we now take for granted. 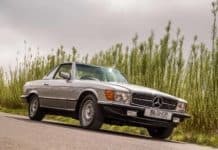 The new Pagoda used a six cylinder fuel injected engine, shared by the 220 Fintails, offering around 150bhp, significantly more than the 102bhp of the 190SL. This engine was already established as being both reliable and smooth, two Mercedes trademarks. As production progressed this engine grew from 2.3, to 2.5 and finally 2.8 litre displacement. 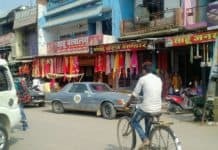 Mercedes’ move away from racing and towards luxury was bold, but the customer response proved them right. Of the almost 49,000 cars sold, 77% of Pagodas were optioned with automatic transmission, proving that buyers were more interested in comfortable cruising than pushing the limits. By the late 1960s the motoring world was evolving. Cars were expected to pollute less, use less fuel, look after occupants better… In short, sports cars had to change. Not content with power output strangling emissions regulations, the Americans were even considering a full ban on open cars! 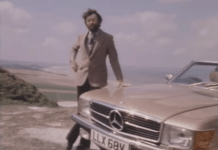 This was a major concern for Mercedes, as the USA and in particular California was a key export market. With all of this in mind, the Pagoda’s replacement had to be a a car of many talents, and oh boy was it. The new design retained the beauty of the Pagoda, pinned around that consistent hip line that began at the headlights and ran almost dead straight to the tail lights. An R107 is a wonderful package of straight lines and hidden curves, wrapped in oodles of subtle chrome. At a glance the amount of chrome adorning an R107 SL is not immediately obvious, but never say that within earshot of someone who has restored one! From a safety point of view, the R 107 picked up where the Pagoda left off. Strong construction and meaty A pillars offered roll over protection, ABS arrived in 1980 with airbag and belt tensioner offered the following January. The build quality and weight of this SL earned it the affectionate nickname ‘the tank’. Offering a range of six-cylinder and V8 engines, the new SL had ample power for all markets, finding buyers around the world. Varying emissions standards between countries meant engines were presented in different levels of tune depending on the destination country. American legislation was particularly harsh, forcing manufacturers to produce engines of larger displacement in order to match the performance of the pre-regulation cars. 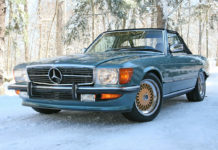 We’ll cover the 1981-86 SL model range in much more detail in future posts. Introduced in 1986 for the last three years of production, the late model R107 was significantly improved. New engines, better suspension and improved brakes made for a more complete package, finished off with a lower front air dam and 15 inch alloy wheels – after all, by this stage the R107 SL had been in showrooms for 15 years! These later SLs are now among the most desirable of all the generations listed on this page. We’ll cover the 1986-89 facelift in much more detail in future posts. All in all, 231,287 R and C 107 SL and SLCs were built between 1971 and 1989. 18 years is a very long time in terms of automotive development, meaning the R129 was destined to be a significant departure from the car it replaced. The manually operated roof was gone, replaced by a fully electronic canvas hood and of course, a removable hard top. 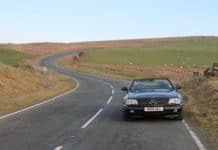 Developed alongside the already well established and superbly solid W124 saloon, the R129 felt sure footed and reassuringly well put together. Critics at the time called the styling too conservative, but that didn’t stop the sales – the R129 was a roaring success in showrooms. The R129 was the first SL to use a V6 engine, the M112, which was a first for Mercedes-Benz. This superb powerplant was used across the range, powering C, E, S, SLK, G and ML Class cars as well as the Chrysler Crossfire. There were many special edition R129 cars produced to mark various occasions, including Mille Miglia, Special Edition, SL Edition, Final Edition and the most desirable of all, the Silver Arrows. The R129 would survive until 2002, but by 1996 a replacement was well underway. 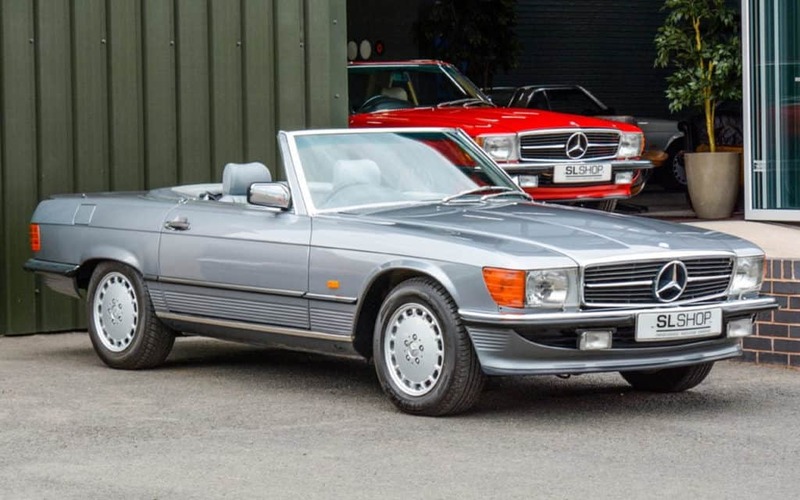 The R230 remained an accomplished grand tourer like SLs before it, but unlike the 113, 107 and 129, this SL was poaching buyers of established sports cars. 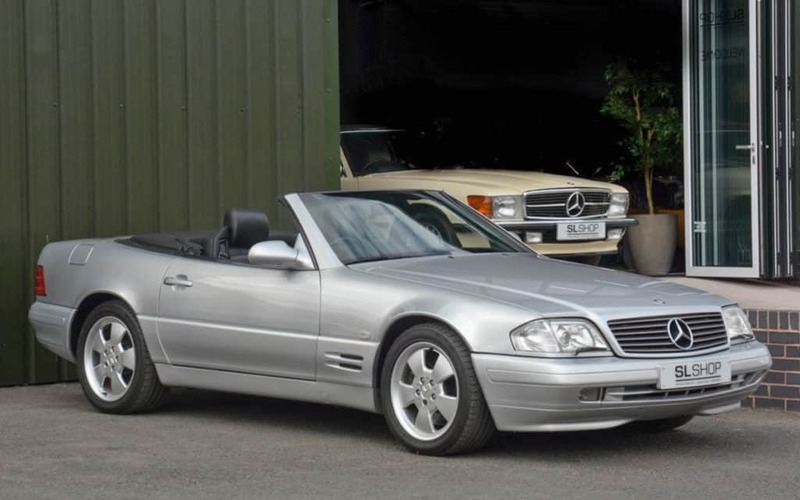 It’s not that the R230 SL moved away from the ‘luxury and convenience’ of previous generations, it’s just that it offered ‘luxury and convenience’ while keeping up with a Porsche 911 Cabriolet on properly twisty roads. Technology began to play a significant role with the R230, a trend that developed with the (then) electronically advanced R129. R230 SLs benefitted from Active Body Control, which was being used in the W215 CL Class, allowing the car to lean into corners, flattening itself to the road for optimum grip. It was technology that proved a huge selling point of the R230 SL – that clever and elegant electronically operated Vario folding roof. It turned the car into a ‘proper’ coupe at the flick of a switch, with no need for a removable hardtop. The relationship between AMG and Mercedes-Benz had developed through the R129, but by the time the R230 came along it was fully established. Less than 2000 R129 SLs left the factory with AMG badging – The R230 would take the AMG badge mainstream. We’ll be publishing more content on this generation of SL in due course, including a buying guide and our hot picks of which model and specification to choose. 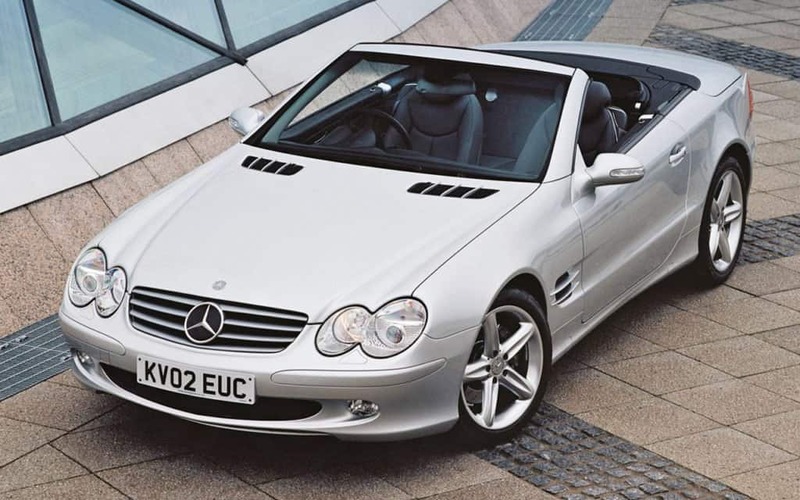 From 2008 the SL lost it’s distinctive headlights and gained a raft of new engines. AMG badged cars went from ‘hmmm, they might be getting a bit silly now’ to ‘yes, the plot has most definitely been lost‘ with the Black Series cars, which offered more power than could feasibly be put down on the road. 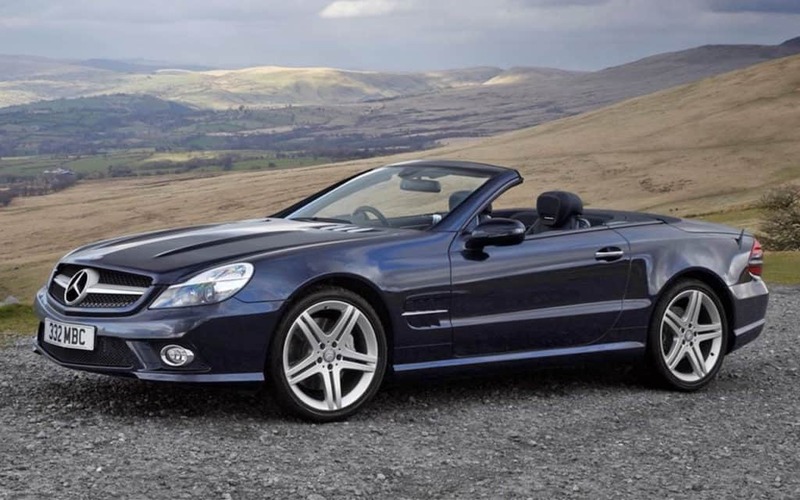 In 2013 the R231 SL arrived, bringing with it a 9-speed gearbox and some very questionably styled headlights. The facelift R231 model introduced a range of new colours and did away with the ‘marmite’ headlights of the previous iteration. 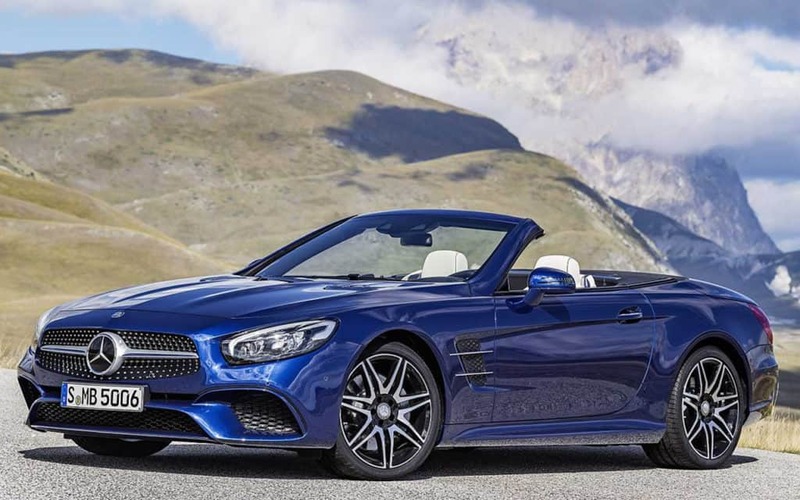 This latest SL offers advanced driver aids, park assist, brake assist, intelligent cruise control, a symphony of electronic trickery that stops short as being completely driverless. Now more than 60 years on, the SL name still represents the pinnacle of grand touring, luxury, performance, safety and technology. Did you enjoy our history of the SL? Did we miss something out, have you got something to add? Have you owned one of these cars and want to make an observation for our readers? Which is your favourite SL, or which is the best looking generation? Let us know in the comments below.